Yunnan (Simplified Chinese: 云南; Traditional Chinese: 雲南; pinyin: Yúnnán; literally "south of the clouds") is a province of the People's Republic of China located in the far southwestern corner of the country. Yunnan borders Tibet to the northwest, Sichuan to the north, Guizhou to the northeast and Guangxi to the east. It also contains China's borders with a number of southeast Asian countries, including Vietnam, Laos, and Myanmar. The provincial capital city is Kunming. Yunnan has earned fame for the natural beauty of its setting from the 1936 book Lost Horizon by James Hilton. The beautiful mountain setting with meadows and fields make the location a place of peace and tranquility. Tibetan monks have practiced their religion in Shangri-la, establishing the Gedan Sumtse Ling Monastery in 1679 as well as Tibetan villages throughout the region. Yunnan enjoys independence by virtue of its distance from the centers of power in China. Bordering Tibet, Vietnam, Laos, and Myanmar, in addition sitting in proximity with India, opens the province to migration of people and ideas. The disadvantage of remoteness from the capital of China is neglect. Yunnan suffers for dire poverty in a number of its districts. Yunnan has not only been important to China's individual history, but it has also played a significant role in the history of human civilization. The Yuanmou Man, a Homo erectus fossil unearthed by railway engineers during the 1960s, has been determined to be the oldest known hominid fossil ever found in China. Along with this discovery, it has been discovered that by the Neolithic period there were human settlements in the area of Lake Dian in Yunnan. Through more close investigation it has also been found that the civilization that grew in that area was fairly advanced, with evidence that they used stone tools and even constructed simple wooden structures. Around the third century B.C.E., the central area of Yunnan around present day Kunming was known as Dian. The Chu general Zhuang Qiao (庄跤) entered the region from the upper Yangtze River and set himself up as "King of Dian." Afterwards, both he and his followers initiated the influx of Chinese influence into Yunnan, which led to a long history of migration and cultural expansion into the region. Bronze sculpture of the Dian Kingdom, third century B.C.E. In 221 B.C.E., Qin Shi Huang of the Qin Dynasty unified China and extended his authority southward, establishing several commanderies and counties in Yunnan in the process. An existing road in Sichuan known as – the "Five Foot Way" – was extended south to present day Qujing (曲靖), in eastern Yunnan. In 109 B.C.E., Emperor Wu sent General Guo Chang (郭昌) south to Yunnan, establishing the Yizhou commandery and 24 subordinate counties. The commandery seat was at Dianchi county (present day Jinning 晋宁). Another county was called "Yunnan," which marked the first use of the name in Chinese history. To expand the burgeoning trade with Burma and India, Emperor Wu also sent Tang Meng (唐蒙) to maintain and expand the Five Foot Way, renaming it the "Southwest Barbarian Way" (西南夷道). By this time, agricultural technology in Yunnan had markedly improved. The local people used bronze tools, plows and kept a variety of livestock, including cattle, horses, sheep, goats, pigs and dogs. Anthropologists have determined that these people were related to the people now known as the Tai. They lived in tribal congregations, sometimes led by exiled Chinese. In the Records of the Grand Historian, Zhang Qian (d. 113 B.C.E.) and Sima Qian (145-90 B.C.E.) make references to "Shendu," which may have been referring to the Indus Valley civilization (specifically the Sindh province in modern Pakistan which was originally known as "Sindhu" in Sanskrit). When Yunnan was annexed by the Han Dynasty, Chinese authorities reported an Indian "Shendu" community living there. During the Three Kingdoms, the territory of present day Yunnan, western Guizhou and southern Sichuan was collectively called Nanzhong. The dissolution of Chinese central authority led to increased autonomy for Yunnan and more power for the local tribal structures that existed there. In 225, the famed statesman Zhuge Liang led three columns into Yunnan to pacify these tribes. His seven captures of Meng Huo, a local magnate, is much celebrated in Chinese folklore. In the fourth century, northern China was largely overrun by nomadic tribes from the north. In the 320s, the Cuan (爨) clan migrated into Yunnan. Cuan Chen (爨琛) named himself king and held authority from Lake Dian (then called Kunchuan [昆川]). Henceforth the Cuan clan ruled Yunnan for over four hundred years. In 738, the kingdom of Nanzhao was established in Yunnan by Piluoge (皮罗阁), who was confirmed by the imperial court of the Tang Dynasty as king of Yunnan. Ruling from Dali, the thirteen kings of Nanzhao ruled over more than two centuries and played a part in the dynamic relationship between China and Tibet. In 937, Duan Siping (段思平) overthrew the Nanzhao and established the Kingdom of Dali. The kingdom was conquered by the Mongol and Chinese armies of Kublai Khan. After the fall of the Mongol Yuan Dynasty, the Ming Dynasty became the ruling force in China from 1368 to 1644. However, they did not send armies into Yunnan until 1381. Instead, their central government allowed the general Mu Ying, foster son of dynastic founder Zhu Yuanzhang to set up a hereditary feudatory system in the province. Throughout the Ming, the Mu family was able to develop tremendous influence in Yunnan through this system. Near the end of the fifteenth century, the Toungoo Dynasty in modern-day Myanmar began encroaching on Yunnan. In the sixteenth century, Chen Yongbin, the governor of Yunnan, held back an invasion from Myanmar through a series of military campaigns. After the war had concluded, he built eight passes along the border in Tengyue sub-prefecture to mark the demarcation between the two countries and prevent any future invasion from the southeast. Regardless of this effort, Yunnan has been subject to heavy influence from the Burmese people throughout its history. After the fall of the Ming Dynasty in northern China, Yunnan became the last Southern Ming regime headed by Zhu Youlang. Supported by rebel loyalists, he employed a policy of resistance against Qing Dynasty conquest even after the Qing had captured the capital city of Kuming. Once the Qing established control over the area, they officially made it into a province in 1659. Following the collapse of the Qing Dynasty in 1911, Yunnan came under the control of local warlords, who had more than the usual degree of autonomy due to Yunnan's remoteness from the Republic of China's capital of Nanjing. They financed many of their regimes through both the harvesting and trafficking of opium. Yunnan remained relatively autonomous throughout the late twentieth century, with varying degrees of influence by the local warlords and the Republic of China government. After the Chinese Civil War, the Republic of China's Nationalist government fled to Taiwan, and the People's Republic of China was established in 1949. The Chinese communist party regained full control of Yunnan in 1950. Yunnan lies on China's southwest border, with the Tropic of Cancer running through its southern part. It has an area of 394,000 square km, which is about 4.1 percent of the nation's total. 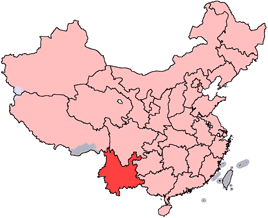 The northern part of the province is part of the Yunnan-Guizhou Plateau. The highest point in the north is the Kawagebo Peak in Deqin County on the Diqing Plateau, which is about 6,740 meters high; and the lowest is in the Honghe River Valley in Hekou County, with an elevation of 76.4 meters. Yunnan has sufficient rainfall and many rivers and lakes. The annual water flow originating in the province is 200 cubic kilometers, three times that of the Yellow River. The rivers flowing into the province from outside add 160 cubic kilometers, which means there are more than ten thousand cubic meters of water for each person in the province. This is four times the average in the country. The province is drained by six major river systems. The Yangtze, known as the Jinsha Jiang (River of Golden Sands) in Yunnan, drains the province's north. 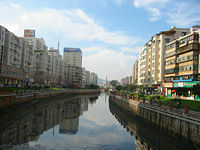 The Pearl River, with its source near Qujing, collects the waters from the east. The Mekong River, which flows from Tibet into the South China Sea, forms the boundaries between Laos and Myanmar and Laos and Thailand, and eventually flows through Cambodia and Vietnam. The Red River has its source in the mountains south of Dali and enters the South China Sea through Hanoi, Vietnam's capital city. Finally, the Irrawaddy River has a few small tributaries in Yunnan's far west, including the Dulongjiang River, and a few other rivers in the prefecture of Dehong. The sixteen prefecture-level divisions of Yunnan are subdivided into 129 county-level divisions (12 districts, 9 county-level cities, 79 counties, and 29 autonomous counties). Those are in turn divided into 1455 township-level divisions (567 towns, 677 townships, 155 ethnic townships, and 56 subdistricts). 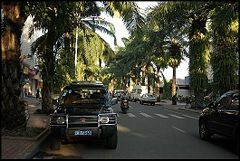 One of Jinghong's many palm-lined streets. Yunnan was first connected by railway not to the rest of China, but to the Vietnamese port of Haiphong by a French engineered narrow gauge railway completed in 1910. It took another 50 years for the province to be connected by rail to the rest of China with the completion of the Chengdu-Kunming railway line. Later on, a line connecting Kunming to Guiyang was built, and two further lines have been added recently: a southern line connecting to Nanjing and a north-eastern line connecting to Sichuan. An extension also links Kunming to Dali, with the stretch to Lijiang nearing completion. Plans are underway to extend the old line to Vietnam, while a new and very ambitious plan to link from Dali to Ruili has been announced in 2006. Another proposal is to extend the railway line from Kunming all the way to Singapore, with connections to the other South East Asian countries. This project is expected to be completed by 2017. Along with rail, road construction in Yunnan continues to increase. Over the last few years, the province has added more new roads than any other province in China. Today, expressways link Kunming through Dali to Baoshan, Kunming to Mojiang (on the way to Jinghong), Kunming to Qujing, and Kunming to Shilin (Stone Forest). The official plan is to connect all major towns and neighboring capitals with expressways by 2010, and to complete a high-speed road network by 2020. In addition to the nation-wide roads, county towns are now accessible by paved, all-weather roads from Kunming. As of now, all townships have a road connection, and about half of all villages have road access. Generally, rivers are obstacles to transport in Yunnan. Only very small parts of Yunnan's river systems are navigable. In 1995, the province invested 171 million yuan to add another 807 km of navigation lines to its river system. It built two wharfs with an annual handling capacity of 300,000 to 400,000 tons each, and four wharfs with an annual handling capacity of 100,000 tons each. The annual volume of goods transported was two million tons and that an additional two million passengers were transported. The Wujiaba Airport in Kunming is a first-class national airport, with flights to Beijing, Shanghai, Guangzhou, Chengdu, Haikou, Chongqing, Shenyang, Harbin, Wuhan, Xi'an, Lanzhou, Hangzhou, Xiamen, Nanjing, Shenzhen, Guiyang, Changsha, Guilin, Lhasa and Hong Kong. In addition, the airport has about eight provincial air routes to Jinghong, Mangshi, Lijiang, Dali, Zhongdian, Zhaotong, Baoshan and Simao. Internationally, there are nine air routes, including flights to Bangkok, Chiang Mai, Yangon, Singapore, Seoul, Hanoi, Ho Chi Minh City, and Kuala Lumpur. Despite the large number of flights, a new airport for Kunming, built east of the city at Dabanqiao began construction in 2006, but is not expected to be completed until 2015. Yunnan is notable among the Chinese provinces for its very high level of ethnic diversity. It has the highest number of ethnic groups among all of the provinces and autonomous regions in China. It is so ethnically diverse, that of the country's 56 recognized ethnic groups, 25 of them can be found in Yunnan. In total, about 38 percent of the province's population are members of minorities, including the Yi, Bai, Hani, Tai, Dai, Miao, Lisu, Hui, Lahu, Va, Nakhi, Yao, Tibetan, Jingpo, Blang, Pumi, Nu, Achang, Jinuo, Mongols, Derung, Manchus, Shui, and Buyei. 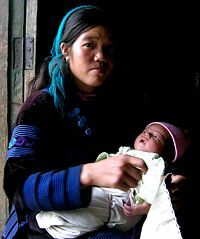 Not only are they plentiful, but the ethnic groups in Yunnan are also widely distributed. Some twenty-five minorities live in compact communities, each of which has a population of more than five thousand. Ten ethnic minorities living in border areas and river valleys include the Hui, Manchu, Bai, Naxi, Mongolian, Zhuang, Dai, Achang, Buyei and Shui, with a combined population of 4.5 million. Those in low mountainous areas are the Hani, Yao, Lahu, Va, Jingpo, Blang and Jino, with a combined population of 5 million, and those in the high mountainous areas are the Miao, Lisu, Tibetan, Pumi and Drung, with a total population of four million. Yunnan's four pillar industries include tobacco, biology, mining, and tourism. The province mainly exports tobacco, machinery and electrical equipment, chemical and agricultural products, and non-ferrous metals. In terms of agriculture, Yunnan's major crops are rice, maize, wheat, tuber crops, peas and beans, rapeseed, peanuts, tobacco, tea, cotton, sugar-cane, and various fruits. More than 150 kinds of minerals have been discovered in the province. Some 13 percent of the proved deposits of minerals are the largest of their kind in China, and two-thirds of the deposits are among the largest of their kind in the Yangtze River valley and in south China. Yunnan ranks first in the country in deposits of zinc, lead, tin, cadmium, indium, and thallium. The potential value of the proven deposits in Yunnan is 3 trillion yuan, 40 percent of which come from fuel minerals, 7.3 percent from metallic minerals, and 52.7 percent from nonmetallic minerals. The rich water resources in the province also offer abundant hydro-energy resources. Largely due to its isolation from China's political and economic centers along the coast, Yunnan is one of the country's most undeveloped provinces with more poverty-stricken counties than any of the others. In 1994, about 7 million people lived below the poverty line of less than an annual average income of 300 yuan per capita. They were mainly distributed in the province's 73 counties and financially supported by the central government. With an input of 3.15 billion yuan in 2002, the absolutely poor rural population in the province has been reduced from 4.05 million in 2000 to 2.86 million. This poverty alleviation plan includes five large projects aimed at improving infrastructure facilities. They involve soil improvement, water conservation, electric power, roads, and "green belt" buildings. Upon the completion of the various projects, the province should be able to solve its shortages of grain, water, and electric power, and substantially improve its roads and ecological conditions. Yunnan's nominal GDP in 2006 was 400.2 billion yuan (US$51.7 billion), with an annual growth rate of 11.9 percent. Its per capita GDP was 8,961 yuan (US$1,160). The share of GDP of Yunnan's primary, secondary, and tertiary industries were 21.1 percent, 42.8 percent, and 36.1 percent respectively. In 2002, its total two-way trade (imports and exports) reached US$2.23 billion. In 2002, the province also signed foreign direct investment contracts involving US$333 million, of which US$112 million were actually utilized during the year. Yunnan has trade contacts with more than seventy countries and regions in the world, and it also plans to establish the Muse border trade zone (located in Ruili) along its border with Myanmar , which should boost the provincial economy and increase economic ties between the two countries. According to statistics taken in 2000, there was a total of 24 institutions of higher learning in the province, with an enrollment of over 90,400 students and a faculty of 9,237. Along with this there were 2,562 secondary schools with an enrollment of more than 2,137,400 students and 120,461 teachers, and 22,151 primary schools with an enrollment of 4,720,600 pupils and a faculty of 210,507. Since the 1960s, Yunnan has made remarkable improvements in the overall educational level of its population. The three major ways this can be observed is through the increasing variety of education types among the population, the increase in the average number of years of education received, and the development of a variety of types of school education. At the most basic level, the enrollment rate of school-age children was 99.02 percent, which is on par with most of the other provinces of China. One of Yunnan's famous products is Pu-erh tea, named after the old tea trading town of Pu-erh, as well as the Yunnan Golden Needle tea. Most dialects of the Chinese language spoken in Yunnan belong to the southwestern subdivision of the Mandarin group, and are therefore very similar to the dialects of neighboring Sichuan and Guizhou provinces. Notable features found in many Yunnan dialects include the partial or complete loss of distinction between finals /n/ and /ŋ/, as well as the lack of /y/. In addition to the local dialects, most people also speak Standard Chinese (Putonghua, commonly called "Mandarin"), which is used in the media, by the government, and as the language of instruction in education. Yunnan's ethnic diversity is reflected in its linguistic diversity. Languages spoken in Yunnan include Tibeto-Burman languages such as Bai, Yi, Tibetan, Hani, Jingpo, Lisu, Lahu, Naxi; Tai languages like Zhuang, Bouyei, Dong, Shui, Tai Lü and Tai Nüa or northern lao dialect; as well as Hmong-Mien languages. 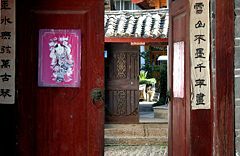 The Naxi, in particular, use the Dongba script, which is the only ideographic writing system in use in the world today. The Dongba script was mainly used to provide the Dongba priests with instructions on how to carry out their rituals: today the Dongba script features more as a tourist attraction. The most famous western Dongba scholar was botanist and explorer Joseph Rock, who wrote for National Geographic. Lijiang, a Naxi minority city that has been a UNESCO World Heritage Site since 1997. The Stone Forest, a series of karst outcrops east of Kunming. ↑ (Chinese) Origin of the Names of China's Provinces, People's Daily Online. Retrieved July 9, 2012. ↑ Tan Chung, A Sino-Indian Perspective for India-China Understanding (1998). Retrieved May 3, 2008. This page was last modified on 7 July 2013, at 20:47.